Samsung is going for the one-two jab with its punch hole cameras. We know a lot about the Samsung Galaxy S10 and S10+ and its rear camera configuration but the front cameras have been shrouded in something of a mystery. UPDATE: The Samsung Galaxy S10 has finally arrived. You can read all about it in our Hands on: Samsung Galaxy S10 camera review. 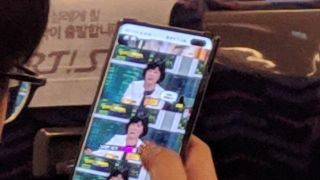 No more, though, as a Redditor has sneaked a peak and picture of the new Samsung Galaxy S10+ and revealed that Samsung has done away with the notch and instead added not one but two punch-hole cameras on to the right of the screen. Given we are mere weeks away from the official Samsung Galaxy S10+ launch, it's pretty certain that this is a real picture of the new phone and the double punch hole may have something to do with improving the face recognition on the device. Whatever the case, the idea of having dual selfie cameras in this configuration is an interesting one and certainly a different approach than the likes of the OnePlus 6T, with its teardrop notch, and the Honor View 20 that has a cutout camera on the other side of its device. Having two cameras on the front should mean that the Samsung Galaxy S10+ is capable of selfies with added depth, better colour reproduction and even bigger wide-angle selfies as well - so you can finally kiss your selfie stick goodbye. As for the other cameras, recent rumours suggest that the Samsung Galaxy S10 and S10+ may come packing a 12MP sensor, 16MP wide-angle lens and a third 13MP lens with telephoto zoom. We will find out when the Samsung Galaxy S10 launches 20. February.